Cranberries have been recorded as part of the North American diet since the Native American Indians showed the Pilgrims how to use the cranberry as a food, dye, and medicine in the 1500’s. Pilgrims also recorded the processing of fresh cranberries into juice in 1683. 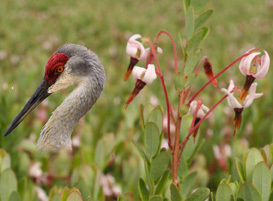 Due to the flower of the cranberry resembling the head and bill of Sandhill Crane, the fruit was named a “craneberry” by early settlers. In 1816, Captain Henry Hall, who fought in the Revolutionary War, was the first to successfully cultivate cranberries in Dennis, Massachusetts. 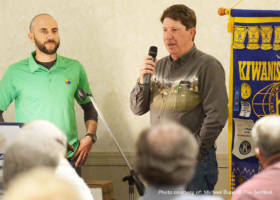 Hall noticed wild cranberries on his land grew better when sand blew onto them, he then began to transplant vines to areas where he could spread sand on them himself. Cranberries grow best in bogs that contain layered sand, peat, gravel, and clay. 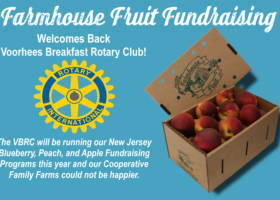 Southern New Jersey has been producing cranberries since 1840, when John Webb was reported to receive $50 per barrel for his cranberries. His cranberries were sold to whalers and sailors who stored them on ships in barrels of water to be eaten along their trip to help combat scurvy. Cranberry grower Elizabeth Lee of New Egypt, NJ boiled damaged cranberries and loved the jelly so much she began selling it as “Bog Sweet Cranberry Sauce” which was the beginning of the Ocean Spray company; they still operate in NJ today. 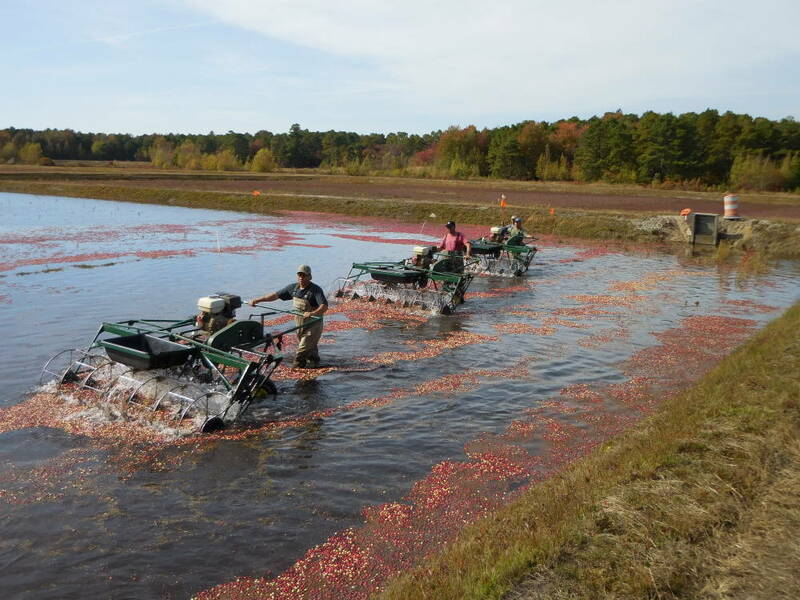 When you think of cranberries, the first thought in your head may be of a flooded bog with cranberries floating at the surface while men in hip waders work to corral the berries. First, farmers must walk behind machines that use large spinning wheels to knock the berries off the vines. 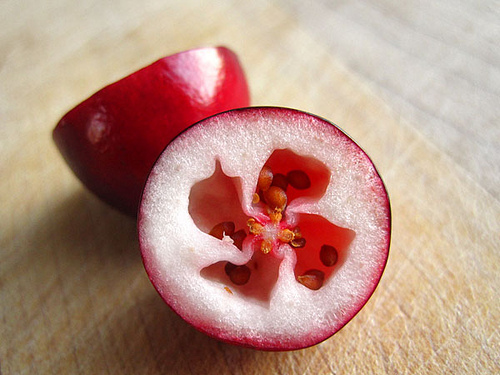 Undamaged cranberries will float due to the four chambers (just like your heart) of air and seeds that are inside the berry. 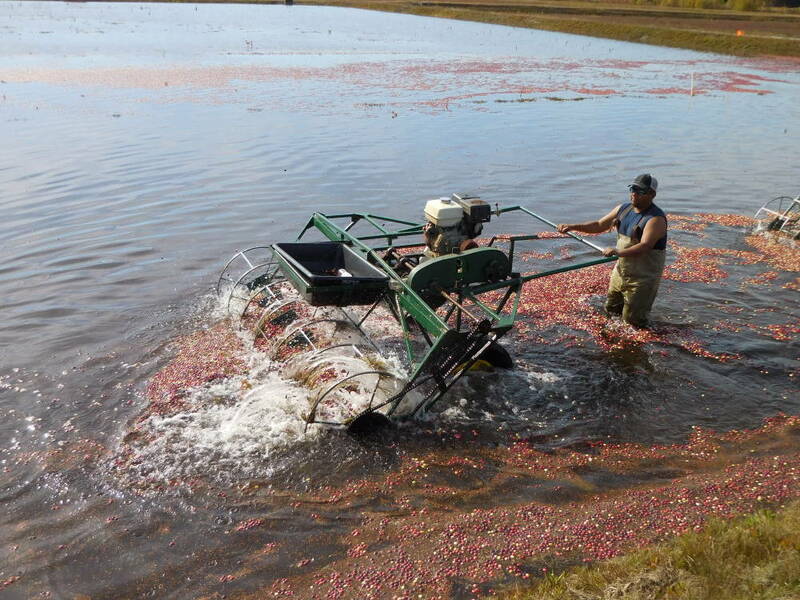 The now floating cranberries will be pushed to a specific corner of the bog where a conveyor belt will move the berries into a truck which will be brought to a processing facility. Cranberries harvested in this manor, known in the industry as a ‘wet harvest’ or ‘water harvest’ are mostly sold to be processed into juice and jams. 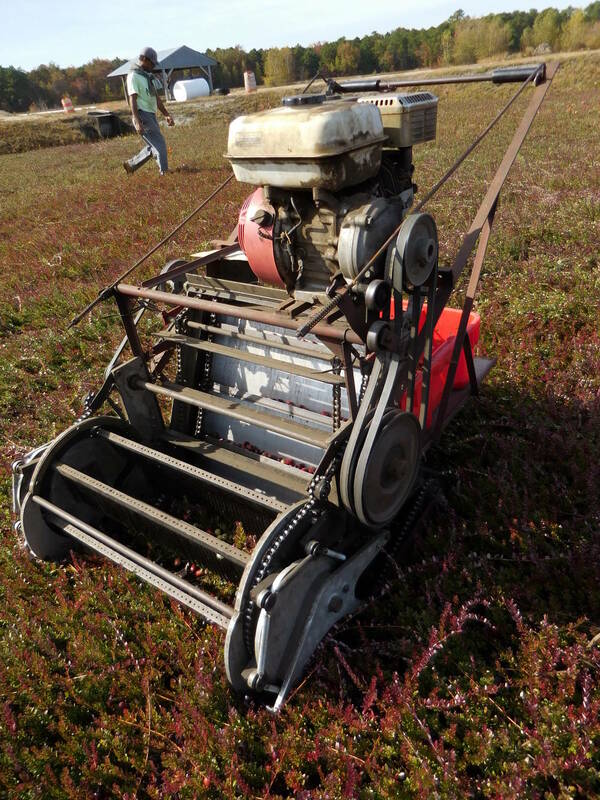 Cranberries destined to be sold as a fresh fruit are ‘dry harvested’ using a walk behind picking machine that ‘combs’ the vine and shakes loose the cranberry. 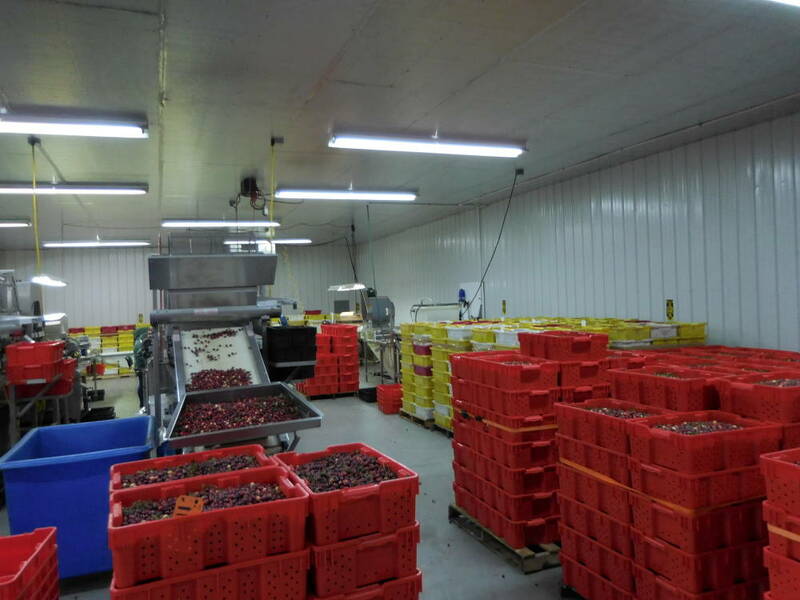 These cranberries are mechanically moved into bins located at the back of the machine, never once touching water until they are cleaned, graded and packaged for sale. These bins are stacked high and loaded onto a truck and taken to a state of the art packaging facility. 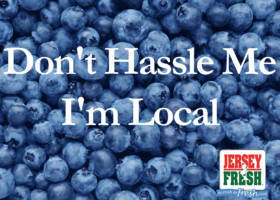 Once in the packaging facilities the berries are sorted on a machine that also sorts Blueberries during the summer months. The cranberries are separated from leaves and vines using air to force the lighter, unwanted material, off the belt. This machines will also discard soft or shriveled berries and will remove any berries that don’t have a bright red hue. The sorted cranberries are weighed and packaged before they are shipped to your local grocery store. Thanks for reading and remember, be part of the solution and not the problem!